Many things cause unwanted noise like traffic and construction. Some sounds are not always thought of as offensive, but they can exceed a comfortable sound level. Examples of this are playgrounds at recess, large gatherings and parties, commercial air conditioning units, warehouse noise, factories, electrical substations, bus terminals, and parking garages. 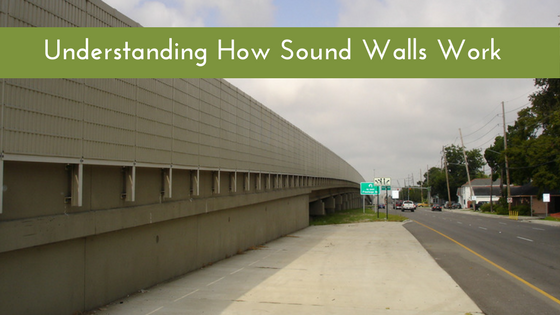 While sound walls are most prevalent along highways, they are also ideal in these commercial settings. There are two primary ways that sound barriers work to reduce sound. They block noise from passing through them, and our sound absorbing wall panels also minimize noise from being reflected off them. The most effective sound wall designs feature both high blockage (STC) and high absorption (NRC). Our noise absorbing material traps the sound within the walls and creates a maze of sorts for the sound wave to travel through while reducing the energy as it does. In contrast, reflective walls, such as concrete, simply redirect sound in unpredictable and unwanted directions.